Last fall, Bob and I ended up spending most of the day at Colonel Samuel Smith Park at the edge of Lake Ontario in Toronto. 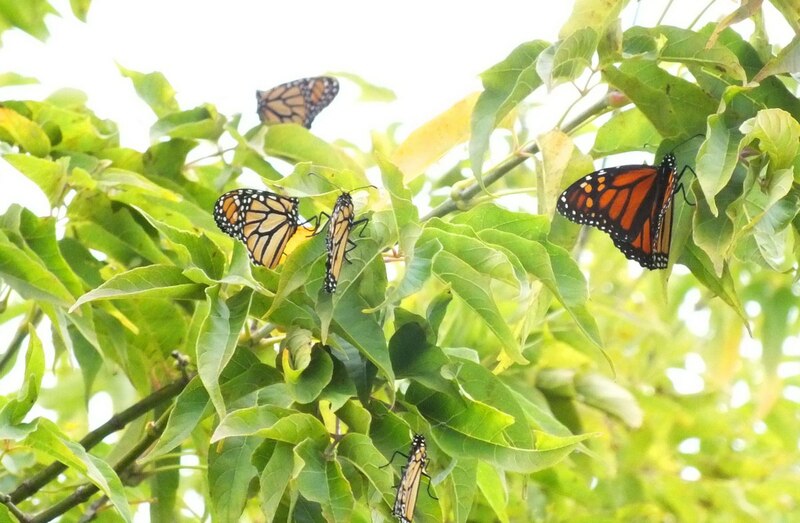 Our mission to locate a flutter of Monarch Butterflies started early in the morning, but it was not until late in the afternoon that we finally knew success. 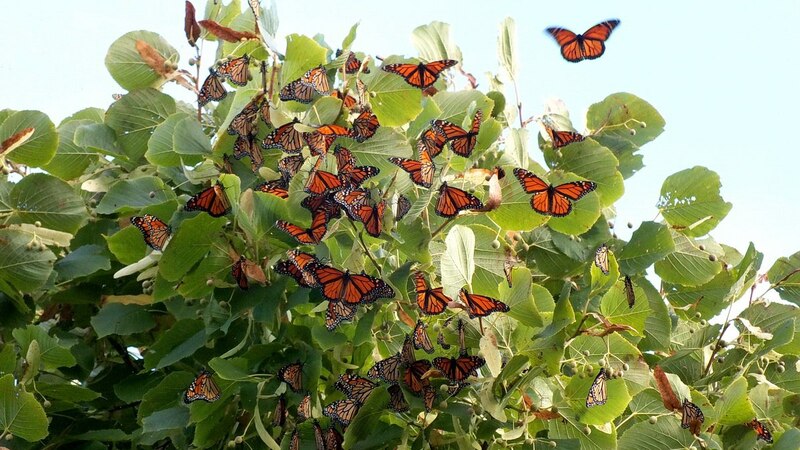 There was no mistaking the chosen tree for its branches hung with hundreds and hundreds of these beautiful butterflies, come together to rest for the night. Our search was based on a photo that appeared on Facebook where someone tipped off enthusiasts to a flutter of butterflies they had witnessed at the Park the evening before. 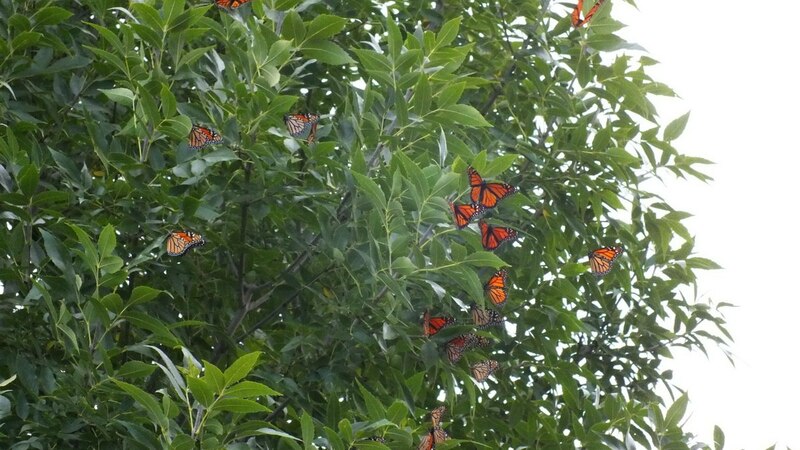 We had hopes of finding the Monarchs still clustered together, if we could locate the precise tree. By sheer luck, we engaged a young lad in conversation as he was walking his dog, and he gladly pointed us in the right direction having himself taken a snapshot of the flutter of butterflies the previous evening. 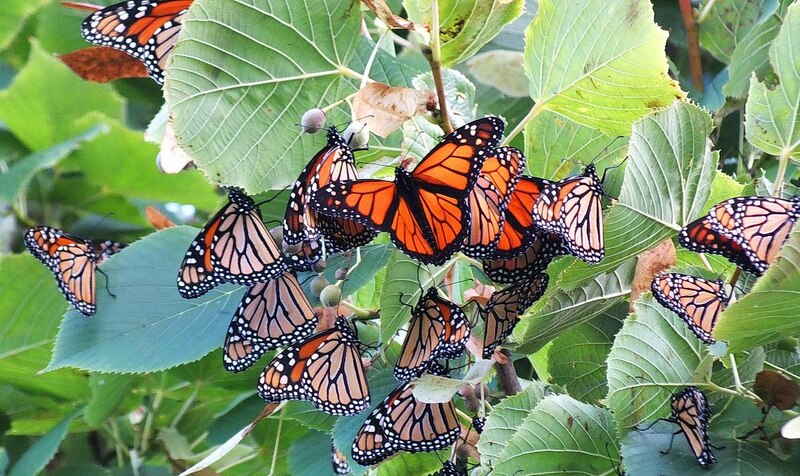 Bob and I had seen a small flutter of Monarch Butterflies a few years earlier, in Milliken Park in Scarborough, but this year, the sighting promised to leave us in awe. 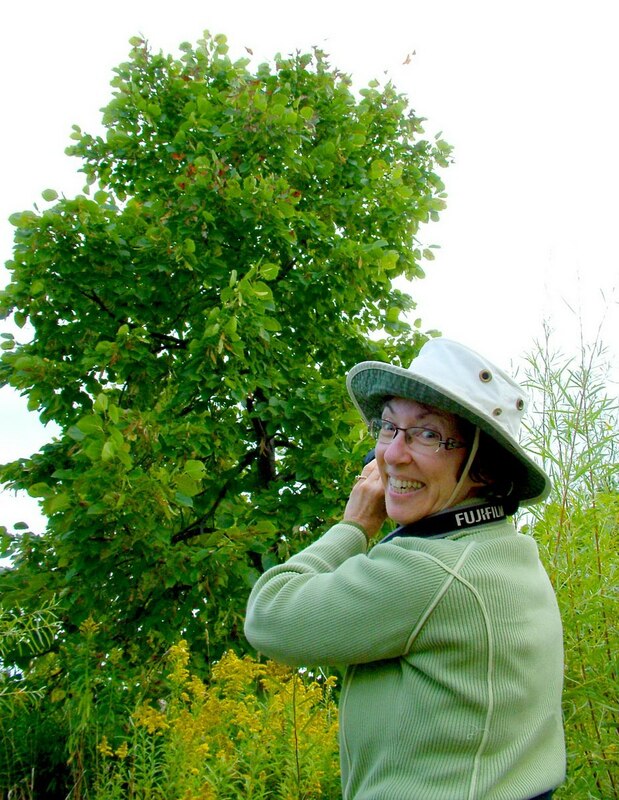 We knew what to look for and scrutinized each tree along the designated trail out on Whimbrel Point, but we came up empty. 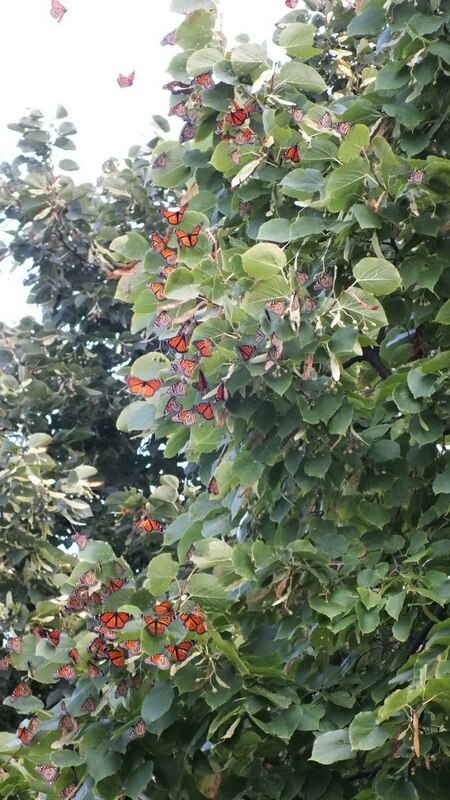 It wasn’t until the dogwalker passed by again and led us to the base of the given tree that we noticed the butterflies. There were so few, only about a dozen, and they were located fairly high up in the branches. Bob and I were so disappointed. Nonetheless, thinking these would be the only butterflies we might see that day, we admired and photographed them as they vibrated their wings to warm up. It was a fairly chilly morning. 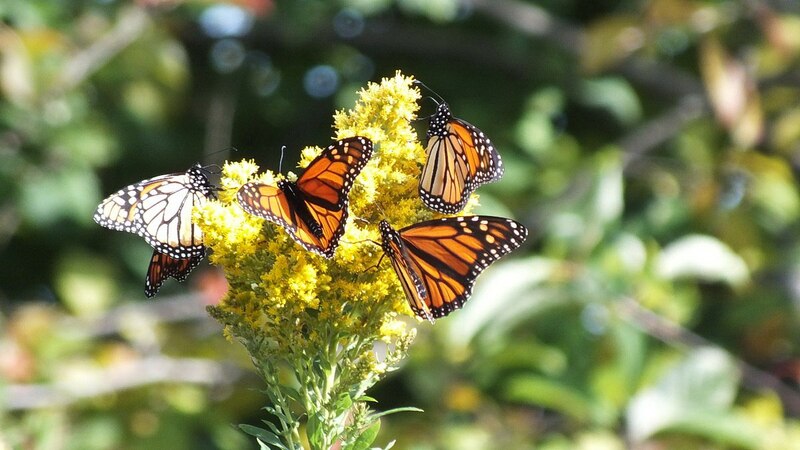 As we looked on, each Monarch eventually took flight, and then, one by one, headed out over Lake Ontario. The sky was very hazy, but we were able to keep them in our sights until their bodies became small specks in the distance. Witnessing this process was very moving. How could such a fragile tiny creature manage to find its way safely to Mexico? 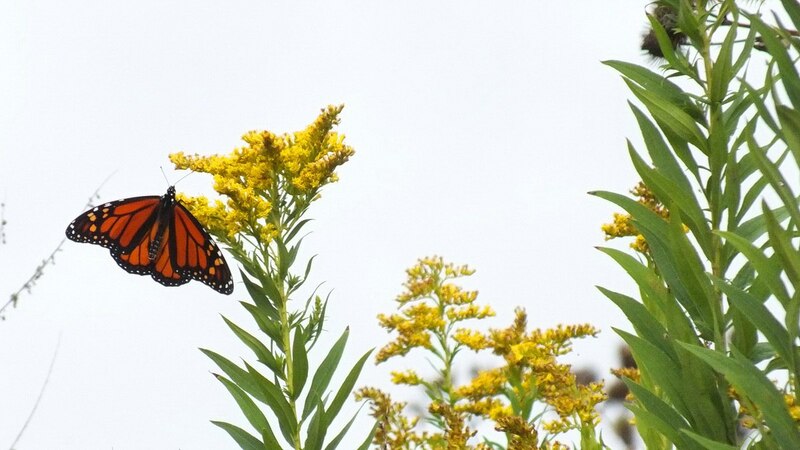 At the same time, other Monarchs were making their way to Whimbrel Point, and often they lit on some of the many goldenrod plants before following on the heels of the other Monarchs. Judging by the overall lack of butterflies and the behaviour of those arriving on the scene, we deduced that the previous evening’s flutter of butterflies must have left en masse very early in the morning. For the remainder of the morning, Bob and I lingered along the walking trails admiring the scenery, breathing in the smells of autumn and photographing birds. A decision was made to return to the Park around 4 p.m. to see if the phenomenon also known as a kaleidoscope would reoccur. Things looked promising even before we left the parking lot. Late afternoon sunshine set the vast fields of goldenrod aglow, and the plants were aflutter with dozens of Monarch Butterflies where this morning there had been none. It is thought that butterflies communicate through the movement of their wings, and certainly all of the Monarchs flitting around the flowers were fluttering their wings a great deal, but I’d rather think that they were simply trying to gather a last bit of nectar before it was time to settle down for the night. The sun was already getting low in the sky, and the temperature was starting to drop. 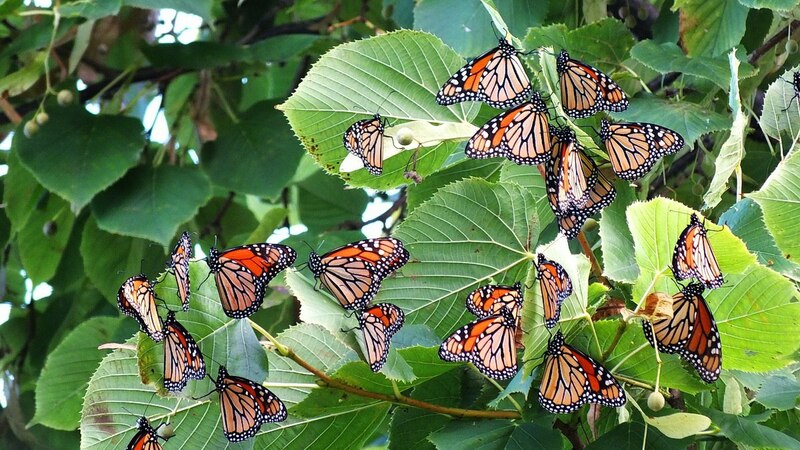 As Bob and I began walking out on the peninsula, we noticed numerous Monarch Butterflies converging on a tree not far from the parking lot. A good number had chosen to land on branches that, unfortunately, were not well illuminated because of the cloud cover, so we snapped a few photos before pressing on. I was determined to go back to the tree near the end of the Point in the hopes that the butterflies would choose to rest in it for a second night. 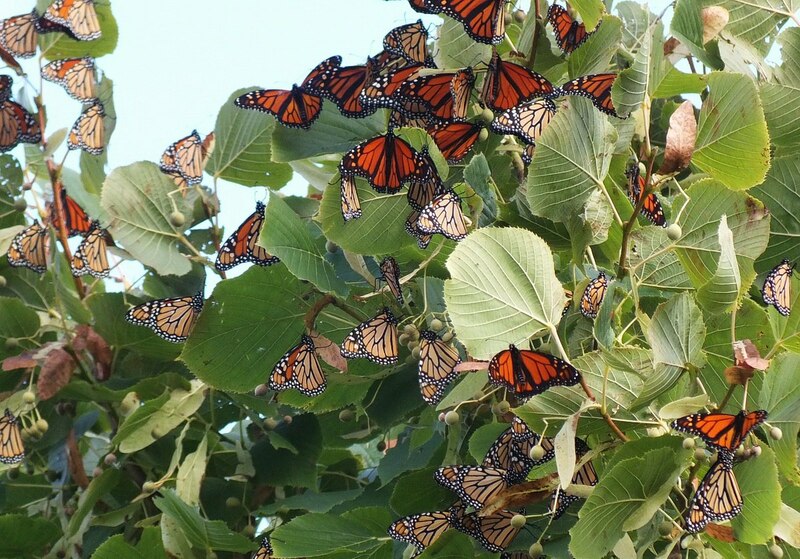 All we found were leaves hanging from those branches, so we put our minds to work to figure out where the Monarchs might choose to assemble on that breezy evening. 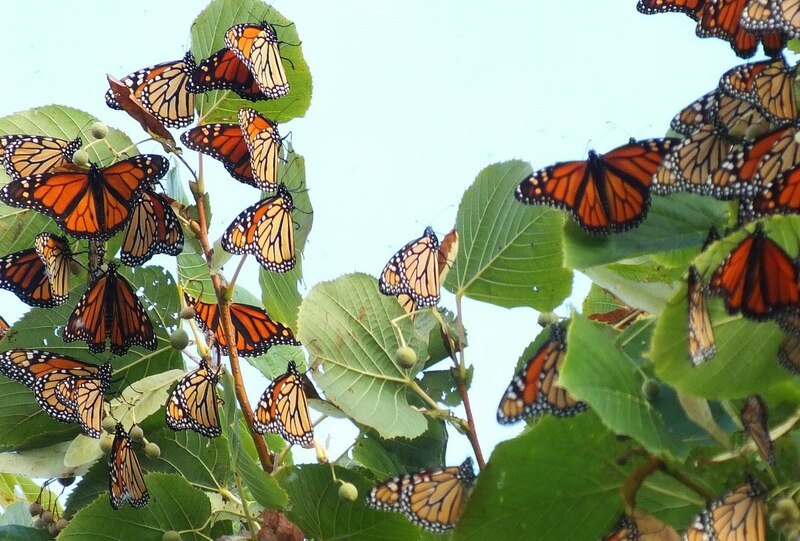 With the winds now blowing from the south, we deduced that the Monarch Butterflies would likely choose to roost on the north side of a tree, so we traced the trail along the harbourside of the peninsula and in a matter of minutes had located the flutter of butterflies. I was ecstatic! Prepare yourself to be dazzled as we were. With such lovely subject matter, we just kept snapping one photo after another. As we stood taking in the beauty of the butterflies, we could not stop smiling and congratulating ourselves for having made the decision to come back to the Park despite it having been a long day. It was worth it to see such a sight. 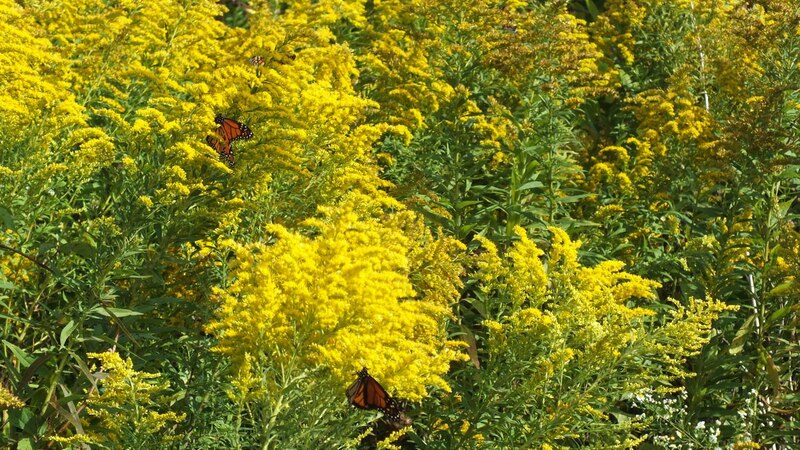 It seemed that all those butterflies seen sipping nectar from the goldenrod were now gravitating to the chosen tree. We must have stood there for close to an hour over which time a constant stream kept floating in on the breeze to join the others. Occasional cracks in the gathering clouds allowed a rare beam of sunlight to fall on the crown of the tree transforming the Monarchs into fluttering beacons of orange iridescence. Each butterfly seemed so perfect, but these delicate, wind-tossed lepidoptera were, in some cases, already showing signs of wear and tear. 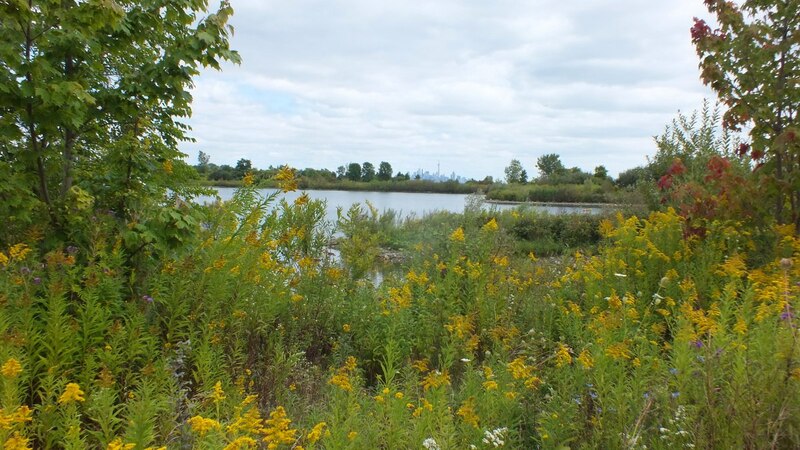 Bob and I have never been to Presqu’ile Provincial Park to witness the assemblage there of the Monarch Butterflies before they migrate across Lake Ontario and onwards to Mexico. 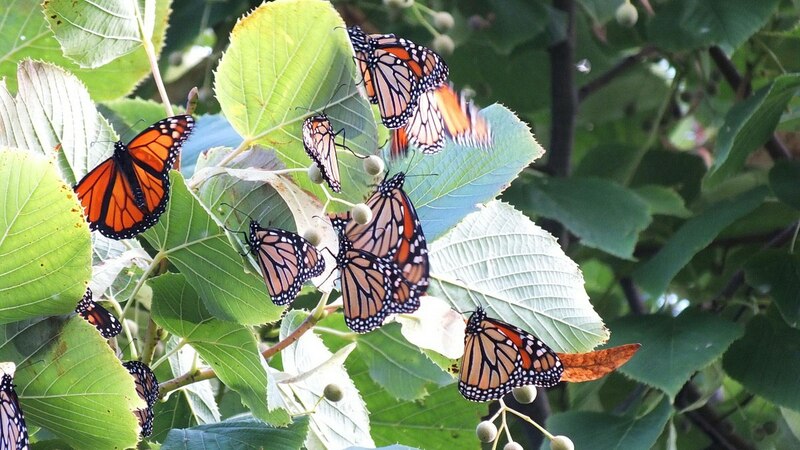 It is supposed to be one of the largest gatherings of these butterflies in Ontario, but we felt the flutter at Colonel Samuel Smith Park gave a fair representation of that phenomenon. 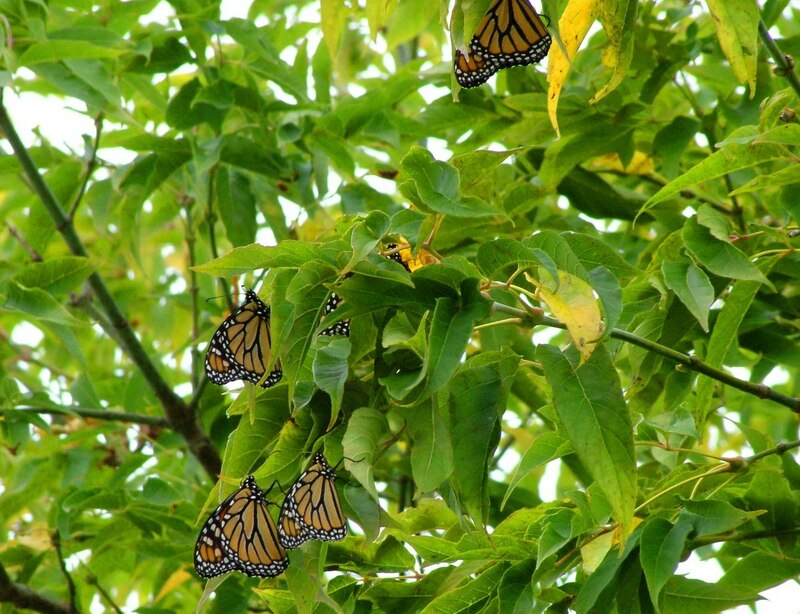 Between the end of August and even into November and December, Monarch Butterflies can be seen flying in a southwesterly direction towards their final destination in the oyamel forests of central Mexico. Sometimes, a person can be so lucky as to see a vast stream of these colourful insects flying together high in the sky as my sister did one late summer day a few years ago. She said they looked like an orange cloud drifting by. 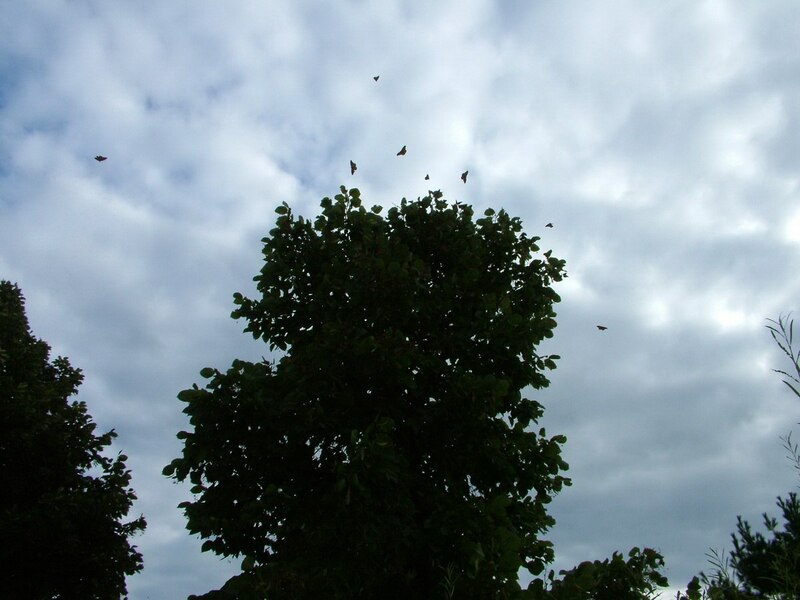 You might think there is safety in numbers, but much to our surprise, as we adoringly watched these butterflies, a small bird of prey dive-bombed the tree sending scores of butterflies into the air. I believe the bird was a merlin, identified as such by another more-experienced birder, and it began picking off a number of the Monarchs as they scattered in the air. We shooed the bird away, and as the Monarch Butterflies settled once again on the twigs and leaves of the tree, the Merlin retreated to a large deciduous tree at the edge of the shore. Soon after, we saw it take wing and sail out over the Lake. That is when Bob and I decided that it was time to head for home. 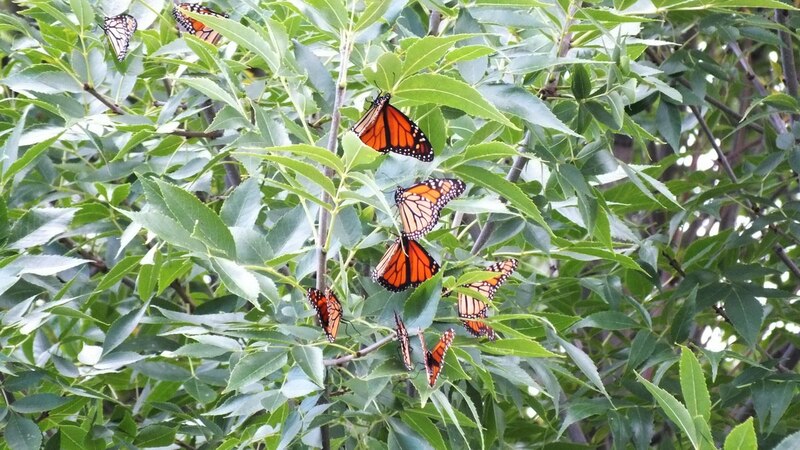 Even as we retraced our steps towards the parking lot, we were treated to another minor gathering of Monarch Butterflies on a bushy tree beside the path. Perhaps they were headed to the other gathering a little further on. We also took note of the first tree near the parking lot whereupon the small flutter of butterflies had been noticed about an hour earlier. Not a single butterfly remained in its branches. 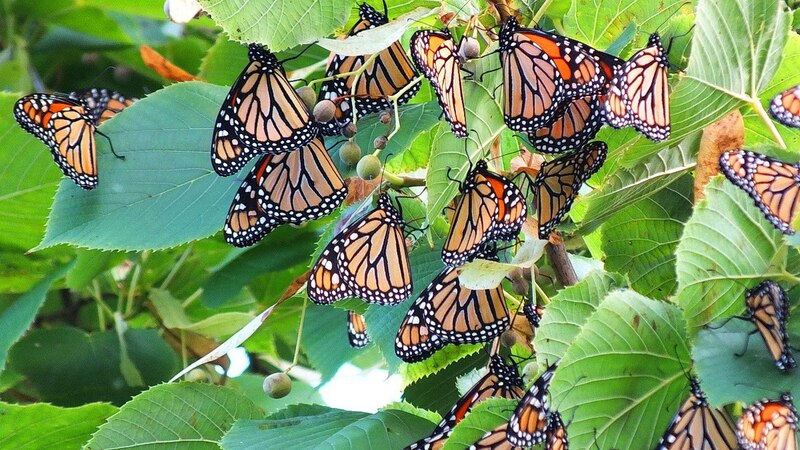 I guess the Monarchs had successfully communicated with one another, and they were now amongst those seen congregating on the tree on Whimbrel Point. As it was, the flutter of Monarch Butterflies that we saw numbered in the hundreds if not thousands, nothing like what one would see in Mexico, for a fact, but hopefully each and everyone of these little scraps of life will find their way across the miles and winter safely in the remote forests of Mexico. They sure have their work cut out for them. Wonderful! 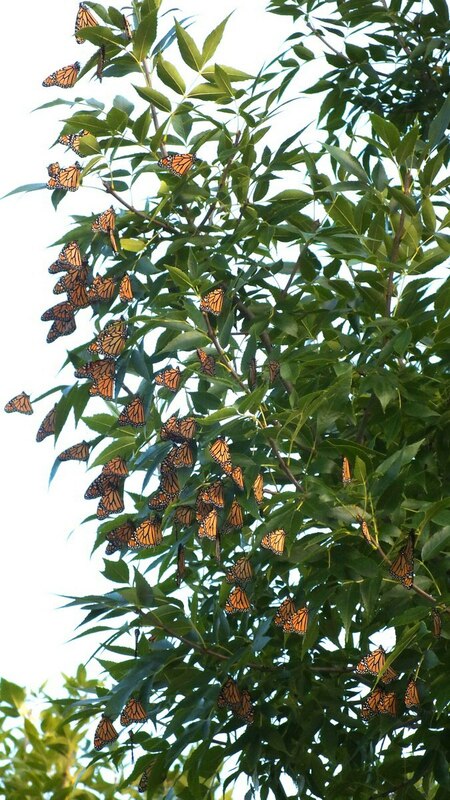 I too have enjoyed watching monarchs cluster in trees on the west coast. Here, they migrate to specific sanctuaries on the coast and overwinter instead of going to Mexico! They like Sycamores & Pine Trees. And hunker together for warmth. 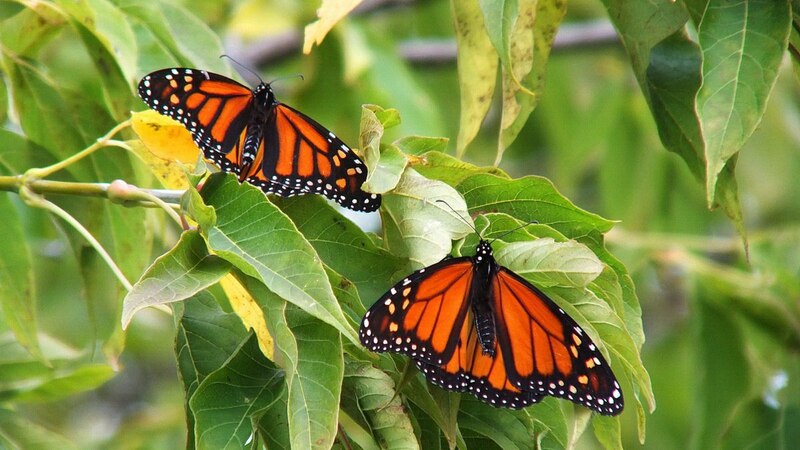 Can be seen Nov. to Jan. What kind of trees do your monarchs prefer? 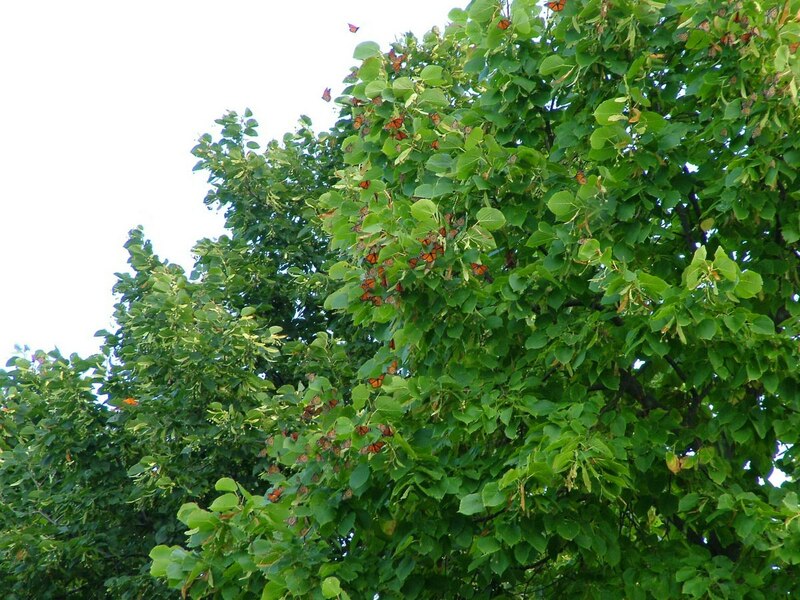 We have seen the flutters of butterflies on various types of trees, so I really can’t say if they have a preference. 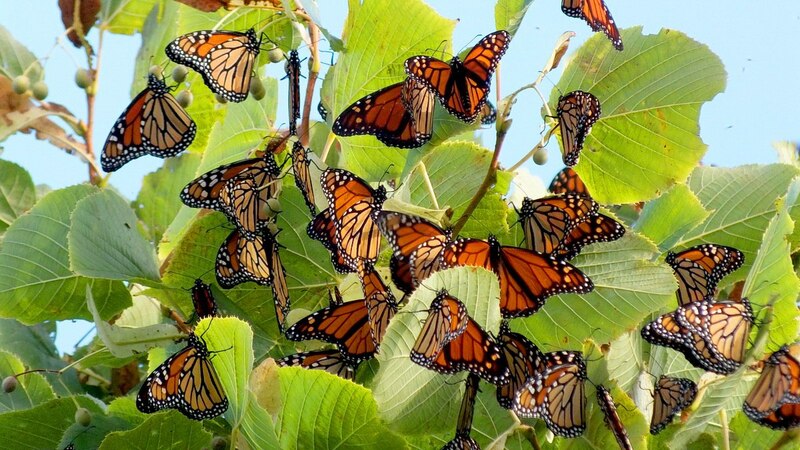 I had read that the western population of Monarchs winters in California. It is nice to hear from someone like yourself who has witnessed it. Do they stay all together in the trees for the duration of the winter season like they do in Mexico?